UK bred, first ever fragrant, hardy primula. Covered in huge, fully double, rose red, ruffled blooms like miniature roses. Easy to grow in sun or light shade. Perfect in a container, woodland gardens, alpine gardens and rock gardens. A classic spring plant, with clean, compact, bright green leaves. Supplied as 3 jumbo plugs ready for potting up and growing on before planting out into their final flowering positions. Belarina primrose 'Carmen' is the first ever fragrant hardy primrose, and heralds the return of spring with ruffled, blousy blooms bursting in a spectacular show of colour throughout the season. 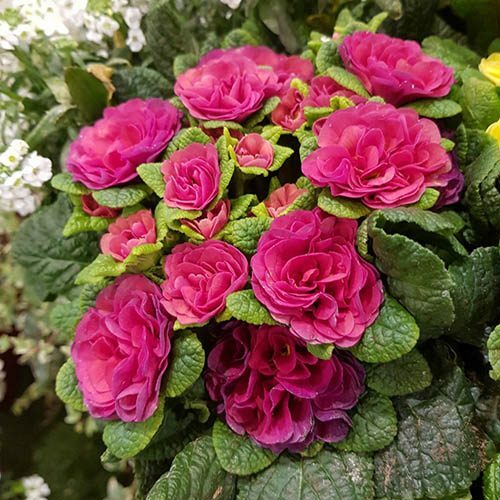 Carmen is likely to become a classic Belarina Primula, with its lightly scented, double blossoms of a vibrant rose-red, creating a dazzling burst of cheerful colour in borders, pots and baskets. Bred in the UK, these fabulous, compact plants are smothered in clusters of delicately fragranced, double flowers which look fabulous wherever you plant them - in pots, containers, beds or baskets, in sun or semi shade – they really are an ideal, easy to grow garden plant. Plus, because the magnificent flowers don't set seed, their energy goes into making more blooms and they'll flower their socks off for months. Perfectly hardy in the garden, they're even better when added to your favourite container as a specimen plant, where you can get up close and personal with their fabulous flowers which complement perfectly their lush, ridged, bright green leaves. Primroses are best in moist, well-drained soil. For best results, plant out from mid-July to early October.